CANADA150 is my celebration of the 150th anniversary of Confederation. All year long I'll be reading Canadian non-fiction and posting about it with the hope of better educating myself about my country's history, and maybe enlightening some random people along the way. Last year, I read Vindication, a biography of Mary Wollstonecraft. I complained at the time that the "silver ship" section in the middle of that book slowed things down a little bit, in contrast with the rest of the fascinating detail about the subject's life. I've just finished another biography of a woman I've admired since long before I knew Mary Wollstonecraft even existed, and I'm sorry to report that rather than having one slow section, the whole book was woefully bad. 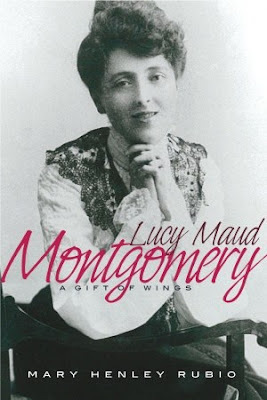 Lucy Maud Montgomery is the ne plus ultra of Canadian blockbuster novelists, even to this day (the only Canadian author I can think of whose work has name recognition anywhere near Montgomery's is Margaret Atwood, which I suppose says a thing or two about Canadian women writers, but feel free to contradict me with any more famous names). I spent my early reading years devouring basically every novel that Montgomery ever wrote, and her books have made an incalculably huge impression on me. It's probably been a decade since I read the last one, because I eventually got disenchanted with her purple prose. Lately, I've been feeling a nostalgic urge to revisit her work, though. It seems that the literary establishment followed a similar trajectory, but I'm getting ahead of myself. After years of publishing short stories, Montgomery wrote Anne of Green Gables, which became an instant hit when it was published in 1908. This book catapulted PEI to a level of fame shared only by Banff, AB, and allowed Montgomery to begin her career as a novelist. When the book, about a red-haired, impetuous orphan girl who finds a home with a bachelor and his spinster sister, was originally published, it was not considered a children's book. Over the years, she wrote many books. Her first publisher was a total jerk and she eventually sold him the rights to Anne and her other early books just to get rid of him (along with several lawsuits). From her position as a famous author, she promoted Canadian literature and authors, and of course her work has endured. Critical opinion and literary tastes over the course of Montgomery's life changed. Eventually Anne of Green Gables was reclassified as children's fiction, though in its time it had many adult fans, including famous ones like Mark Twain. Montgomery was scornful toward trends that saw fiction moving away from happy endings and toward gritty realism. (One wonders what she'd think of the current "gritty reboot" trend.) But modernism took hold in the literary world, even though Maud still had many readers. Despite critical opinion, her writing career was a success, but Montgomery's personal life was quite tragic. She married a Presbyterian minister, Ewan Macdonald, and had two sons, Chester and Stuart. The family lived in Ontario. Ewan suffered from depression or anxiety or some other mental disturbance, which seriously hampered the Macdonalds' married life and Ewan's career. Stuart went on to a successful career in medicine. In contrast, Chester was a problem child throughout his youth and adulthood, stealing from and harassing his mother's maids (to enable her writing, Maud always had a live in maid), sleeping around and eventually abandoning his first wife. He eventually got caught committing fraud and went to jail, then died young. Montgomery herself felt things very keenly, and unloaded all of this into a painstakingly kept journal. And here is where my problems arise. Mary Henley Rubio edited Montgomery's journals along with Elizabeth Hillman Waterston. She probably knows Maud better than many of the people that knew her during her lifetime. This led to an exhaustively (and I do mean exhaustively) detailed recounting of Montgomery's life story. The first 37 years of her life, in PEI, make up about 150 pages of this book. The final 31 years, after her marriage and move to Ontario, comprise 450 pages, and they are horribly repetitive and, as far as I could tell, filled with speculation about various people, events, and motivations. This section could've easily been cut in half, and I wish that Rubio had had a better editor. I was so bored by the end that I couldn't wait for it to be over. I suppose the fact that this is 600 pages long should've prepared me. On the other hand, a lot of people seem to really love this biography. I don't know if this is because Montgomery inspires fanatical devotion and people really want to know all the gory details, or what. Certainly I would've appreciated less gore. I do have to admit that I kept reading because although I was terribly bored, this book had at least one positive effect: I've been journalling way more again since I started reading it, and maybe, just maybe, I'll be getting back into some fiction again soon, too. Judging by the journal excerpts in the book, my journal is a lot more boring and a lot less well-written than Montgomery's, but it's something that's been part of my life even longer than her work has, and I have this biography to thank for reinvigorating the practice of keeping it for me.